For each item, a rating of (usually 5) stars is displayed. This rating is the average of all ratings given to the item. …a dialog appears for rating the item. 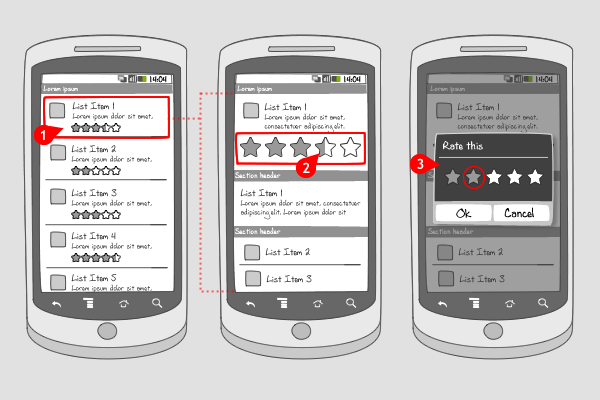 The user can assign a number of stars by tapping them, and save the rating. Ratings can be used when you want the quality of content to be judged by its users. The amount of stars given by other users matters when the user has to make a choice for downloading or opening an item. A high rating (a lot of stars) will persuade the user more likely to make the download. Usually, 5 stars are used to give a big enough rating range. As explained above, the displayed rating can also show half highlighted stars. Don't forget to add the number of ratings somewhere to make the rating actually valuable. An other way to let users give their opinion on items is by liking or disliking or commenting. Adds value to your app's content, because the user gets involved in giving his opinion. 1 Youtube displays ratings for al videos in a list. 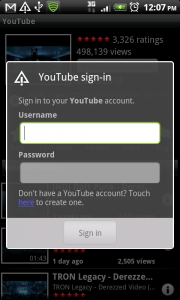 3 ...the user needs to sign in to his YouTube account. 4 When logged in, a dialog appears in which the rating can be given. 5 Tapping on the stars and the rating is stored. The user has to tap outside the dialog to return to the video. Should it be possible to rate zero stars? i have that problem in iPhone application and i solve it by making it possible to slider the starts and if you slide outside in the left side you rate zero. But it is not intuitive. Maybe we can add a “NO” sign in the left to tell the user you can clear the stars? But it will looks ugly, though. Solution: – and + signs before and after the stars. This can increase and decrease the value in increments so that even half star ratings can be acknowledged and thus also enable the 0 star evalutation. + and – buttons are gigantic — use more vertical space and add an ‘okay’ or ‘rate’ button so if user presses okay/rate -> no stars are used.